6 April 2010, at 8:38a.m. ECUADOR - Aviagen recently spotlighted the industry's strongest poultry breeding portfolio at AMEVEA, the Poultry Specialist Veterinarian Association meeting in Quito. 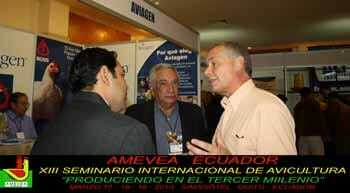 The semi-annual conference was held in March in Quito, Ecuador, and attracted 450 AMEVEA delegates from around the world. Dr Luz Patricia Urrea from Avicola, Aviagen's Colombian distributor, delivered an excellent presentation on Ross 308 broiler development. The well-received session highlighted performance figures and trends observed in Colombia from 2008 and 2009, and confirmed genetic trends previously reported by Aviagen. The Ross 308 is an ideal breeder/broiler for low-cost production and increased return on investment. With a low FCR, high chick numbers and strong liveability, the Ross 308 is the world's most popular multi-purpose bird. Luis Cesio, Aviagen sales manager for South America, said: "Collaboration with our customers is a key focus for Aviagen. Aviagen's participation at AMEVEA demonstrates our company's strong commitment to the local market in Ecuador, as well as supporting this important event where local growers can gain valuable information and insight for making their businesses more successful."